"They know exactly what's happening around them — these are very close family members." 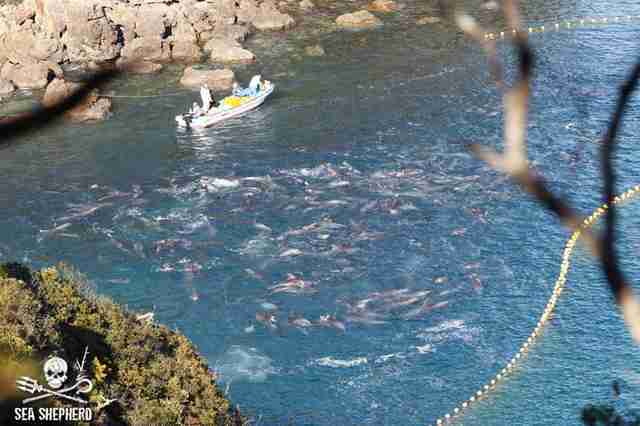 On Friday, hunters in Taiji, Japan, found the worst possible surprise: a superpod of around 300 dolphins. They drove the family into the nearby cove, dropping a net behind the panicked animals, and left them there to wait for the worst. For the next several days, they combed over the dolphins, selecting the youngest and prettiest to be sold into captivity. By Monday, at least 80 dolphins had been taken for marine parks and aquariums around the world - many of them only babies, torn from their mothers' sides. The selection was still going on on Monday night. 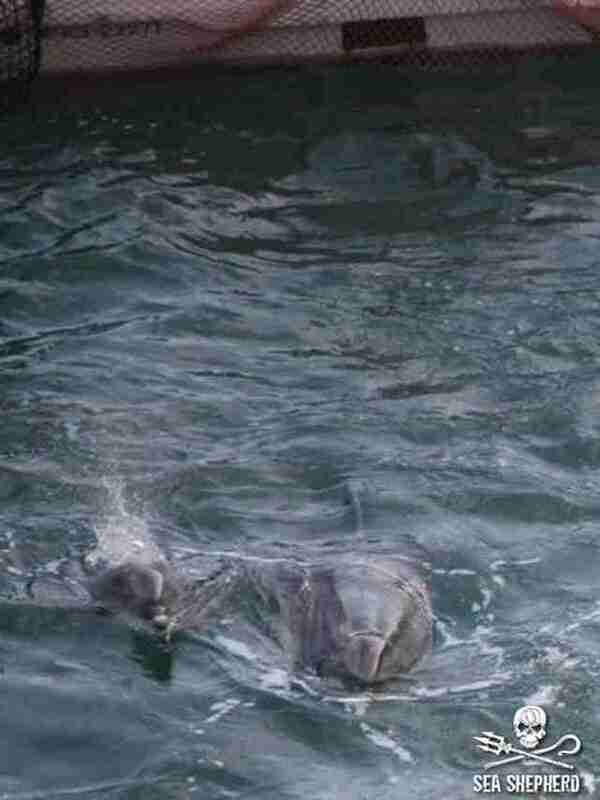 The dolphins, who have been left in the freezing shallows to starve during the process, are frantic - several of them have died from stress and fear. But when one lucky dolphin escaped from the nightmare scene, even the horror he'd been through wasn't enough to make him leave his family. 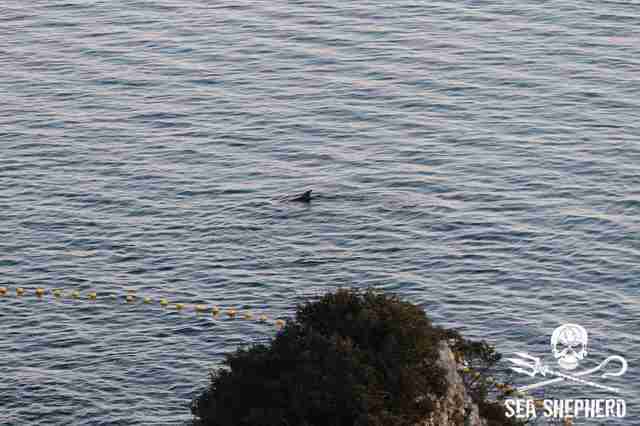 On Monday, Sea Shepherd, which has a team of volunteers in Taiji monitoring the slaughter, shared a photo of a single dolphin floating outside the net that separated his family from freedom. Instead of swimming away, he seemed to stay close to the net, keeping his head near the surface of the water. "We noticed a dolphin had escaped the outer net, with no barrier to stop it from swimming out to open sea," Sea Shepherd wrote. 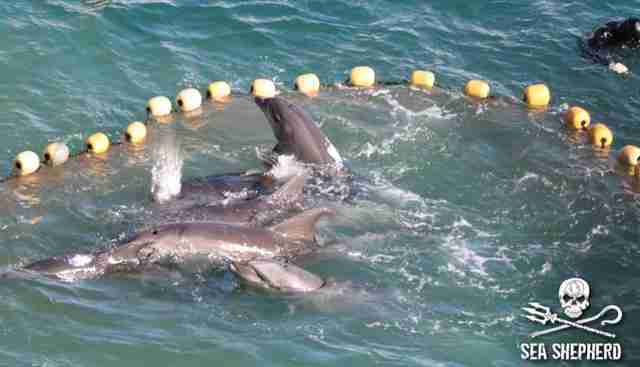 "Dolphins are incredibly socially bonded creatures, and will not leave their pod behind." "This is why cutting the nets would not work, as their loyalty to to their family would prevent them from leaving any members of the pod behind," the group added. It's unclear what happened to this individual after the photo was taken, but sadly it's just one more tragic story in the litany of lives loss this year. 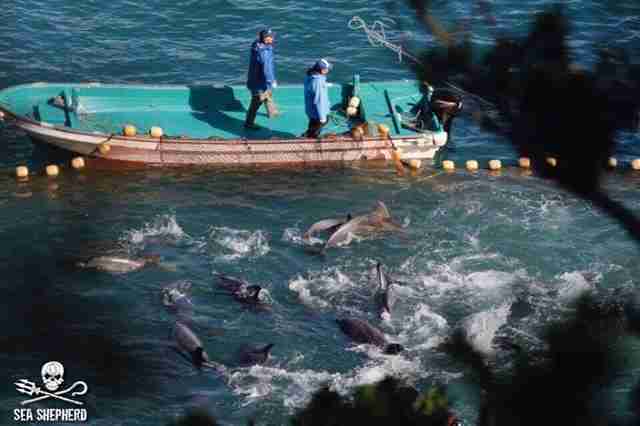 Each year, hunters round up hundreds of dolphins in the annual Taiji dolphin hunt. The younger and more attractive ones are stolen from their families and sold off to marine parks around the world. 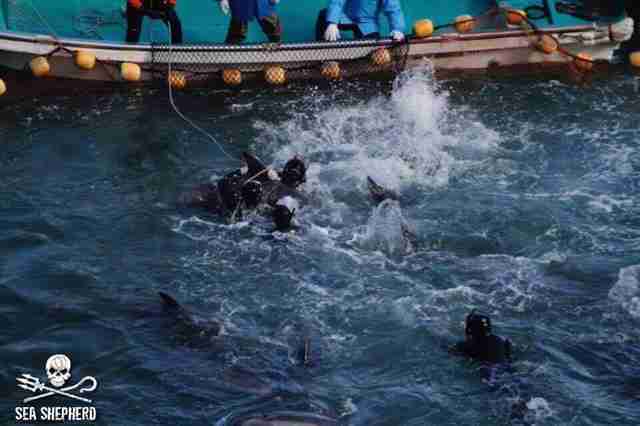 The hunters can earn well over $100,000 USD for each trained dolphin. But the vast majority of dolphins, who are deemed too old or unattractive, are butchered for their meat. 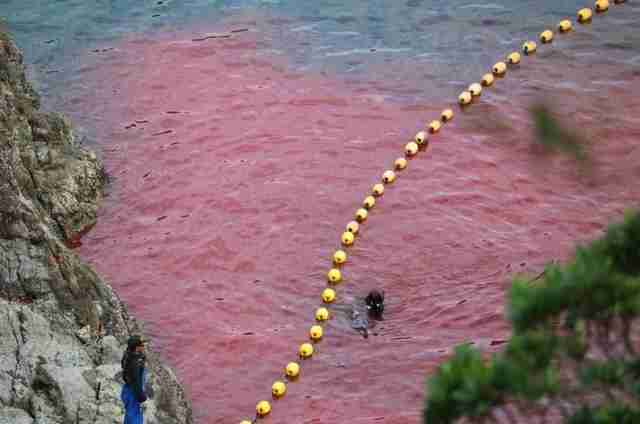 In the days after a successful hunt, the infamous "killing cove" turns bright red with blood as the dolphins are tortured and killed in front of their families, who watch and wait their turn. Footage and photos of this weekend's selection process show the dolphins splashing around in terror, grouping themselves into little knots for comfort as they seek desperately to escape. In some cases, tortured past their breaking point, they've given up and died. 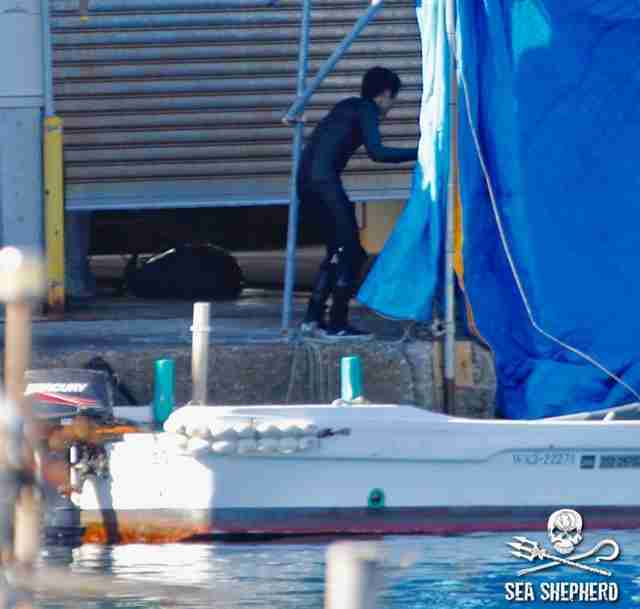 While Sea Shepherd speculated that the surviving dolphins would be turned back into the cove, instead of slaughtered, it's hardly a happier outcome for the sensitive animals - who are inevitably traumatized by the experience. "It's exactly like putting a human being in a situation where they're watching their family members get killed," Dr. Heather Rally, a marine mammal veterinarian who currently works with the Peta Foundation, told The Dodo. "These are lifelong traumas," she said. "These animals are highly self-aware so, just like you and I, they know exactly what's happening around them - these are very close family members." That trauma can lead to a host of physiological issues - both during the hunt and after it. 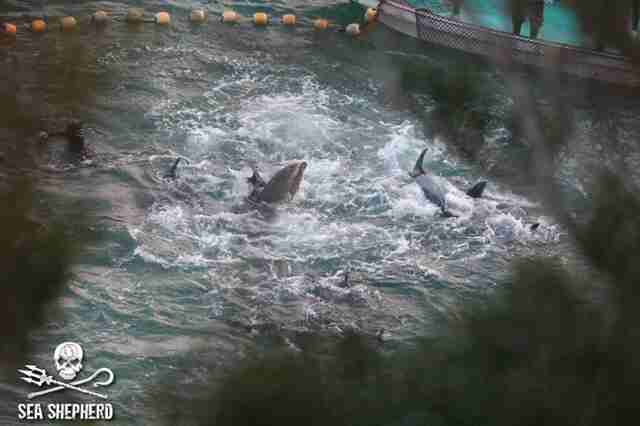 For those dolphins taken into captivity, it can even lead them to kill each other or attack their trainers. "This is a very life-threatening situation," Rally said. "It can cause lifelong health issues. It can cause imminent health and welfare issues ... It can cause stomach ulcers and stereotypic behaviors." Of course, that doesn't matter much to the town of Taiji, which indirectly backs the dolphin hunt - the nearby Taiji Whale Museum, a city-owned "museum of death" that hosts a collection of whaling paraphernalia and its own captive troupe of performing dolphins, helps facilitate the sales of the captured animals. While many people claim the hunt is a tradition, the truth is it's a recent invention - the massive slaughter wasn't even possible until the modern advent of the powerboat. "The entire pod of around 300 dolphins have been subjected to appalling levels of cruelty and torture," Sea Shepherd said. "This is not tradition - this is greed, pure and simple." Unfortunately, there's little that people on the ground can do. The area is highly policed, and attempting to interfere would lead to immediate arrest by Japanese officials. And, as the lone escaped dolphin shows, it's not as simple as cutting the nets. But Sea Shepherd is hoping that, by sharing the superpod's story, people around the world will realize just how brutal the hunt is - and do what they can to stop it. "This is all done in the name of marine park revenue," Sea Shepherd wrote. 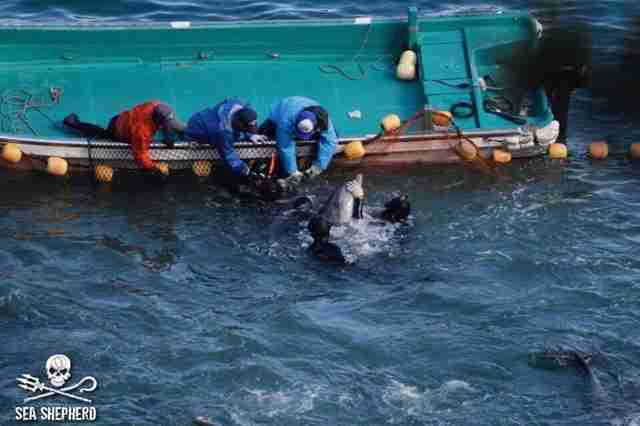 "Aquariums, zoos and marine parks alike who keep once wild animals, all play a part in the horrific, six-monthly dolphin hunt that occurs here in Taiji ... Say no to marine park tickets. Animals behind glass didn't wilfully give up their free lives." To help stop the Taiji dolphin hunt, you can send letters to Japan's prime minister and Taiji's Australian sister city asking them to take action. You can also take a pledge promising not to go to dolphin shows, as many of them support the Taiji hunt. To help the on-the-ground efforts, you can make a donation to Sea Shepherd or The Dolphin Project, or find out how to volunteer yourself here and here.